The Haralson Invincibles Camp had been dormant for six years. Upon the request of the Upper Division Commander, Charlie Lott, Curtis "Bear" Hamrick was appointed the Commander of the camp. At the same time, one of the former members of the camp was appointed Lt. Commander and our Adjutant transferred in from another camp. We held our first meeting in July 2004. This was held as an informative meeting and we had approximately 50 people to attend. We have been off and running ever since. Camp 673 has the only known Abraham Lincoln impersonator in the entire Georgia division of the SCV. Lt. Commander Boarts does a fantastic job of recreating the true President Lincoln. He adds informative Historical documentation to the skit that many people have never heard. At a Haralson Invincible's function, Lincoln will walk toward the audience and tell the Life of the President of the Union during the war. We have established an artillery crew, infantry, a color guard made up of teenagers and a mounted cavalry. We have a new 12 lb. Napoleon Cannon that was donated to us and was christened,"The Preacher". At the September 2007 monthly meeting, Curtis Hamrick resigned his duties as Camp Commander. An election was then held and Mark Thomas became the new Camp Commander. His dreams are that the Haralson Invincibles will grow to be considered the Camp with the most members in the entire Sons of Confederate Veterans! We have chosen for our camp logo, The Phoenix. As it rises from the ashes, so has the Haralson's Invincibles Camp 673. We have grown in the past few years and we hope to continue that routine! Compatriot Harry Lyle recently purchased numerous copies of books to distribute to local schools and libraries concerning Georgia's Black Confederates. We then repaid him for his purchase and had a sticker placed inside of the books recognizing Camp 673. 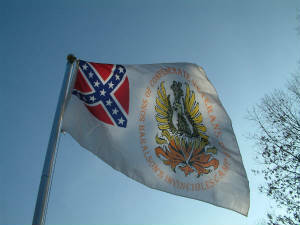 We want Haralson, Cleburne (Al) and Carroll County to understand that this was a fight for all of Georgia no matter what their ethnicity. By promoting this book everyone can see what the War Between the States was about and who was involved. We have services honoring the memory of Confederate Soldiers buried in local cemeteries across Haralson, parts of Carroll and Cleburne(Al)Counties . We also participate in various parades and festivals in the area to recruit new members and present to the community who the Sons of Confederate Veterans really are! We hold our meetings the 2nd Tuesday of each month at the Outpost Music Barn in Bumcombe, GA. We begin at 6:30 PM. with a covered dish supper and our meeting begins at 7:00 PM.